A true story-as powerful as Schindler-s List-in which the keepers of the Warsaw Zoo saved hundreds of people from Nazi hands. When Germany invaded Poland, Stuka bombers devastated Warsaw-and the city-s zoo along with it. With most of their animals dead, zookeepers Jan and Antonina Zabinski began smuggling Jews into empty cages. Another dozen -guests- hid inside the Zabinskis- villa, emerging after dark for dinner, socializing, and, during rare moments of calm, piano concerts. Jan, active in the Polish resistance, kept ammunition buried in the elephant enclosure and stashed explosives in the animal hospital. Meanwhile, Antonina kept her unusual household afloat, caring for both its human and its animal inhabitants-otters, a badger, hyena pups, lynxes. In another author's hands, this book could have been amazing and deeply profound. The subject matter is fascinating, and I found myself wanting to know more about the zookeepers, Jan and Antonina, and the people who passed through the zoo during World War II. The problem is that the author spent so much time describing ancillary topics, that I felt this book was very choppy and disjointed. Her ability to dramatize even the most anxious situations was completely lost. I am not sure if she was limited by the amount of information provided in Antonina's diary, but there are numerous accounts of life in the Warsaw Ghetto that she could have tapped into to tell a riveting story. I am frequent reader of non-fiction and especially World War II accounts, but the way this book was written makes the story drag on and become tedious at times. There were so many animals and people described in short blurbs that it became quite difficult to follow and relate to the individuals in the book. I think more time and attention should have been given to describing the Warsaw ghetto and the Underground instead of spending numerous pages listing and describing insects and other tangential ideas that had very little to do with the story. This is a powerful read and should be required reading for all high school seniors. One must learn about the atrocities of the halocaust; remember history can be repeated. A CAGEY TALE OF COURAGE!! Please pardon the title of this review but I couldn't help it. I love this book not only because of its most unusual subject matter but because of what it tells us of the undaunted nature of the human spirit. During the most vicious enemy occupation in history the keepers of the Warsaw Zoo, Jan and Antonina Zabinski, display incredible courage and determination in using the resources at their disposal (the zoo) as a place of refuge for Jews seeking escape from the hands of the Nazis. Diane Ackerman tells this true-life tale with all the literary grace and style we have come to expect from her other works. The book reads like a novel, we are caught up in the characters, and their very real story creates a page-turning plot. Yet in the midst of the danger and grim circumstances of living under Nazi occupation, Ackerman treats us to the tenderness of Antonina's love of animals and the joy that they bring in brightening the lives of the unfortunate humans in their midst. I had the pleasure not long ago of reviewing another book set in Poland during World War Two, the award-winning historical novel, Night of Flames: A Novel of World War II by Douglas W. Jacobson. Though it was written as fiction, Jacobson's dilgent research brings occupied Poland into vivid reality. 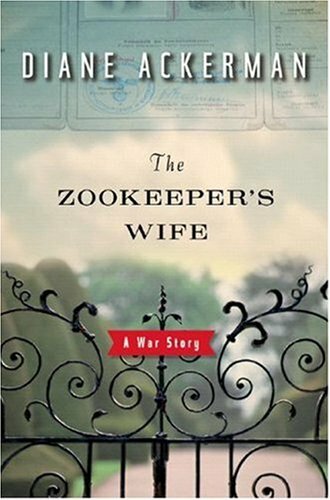 Here in Ackerman's ZOOKEEPER'S WIFE we are treated to the opposite, a true story written with the all sensitivity and skill of an accomplished novelist. We live through the tension-filled days feeling Antonina's every emotion, experiencing Jan's steely pragmatism, and watching their son Rys' coming of age. We even get to play soccer with a badger. This book is an emotional roller coaster. Ackerman starts out displaying her marvelous descriptive skills, setting the stage. "...on warm days, when the linden trees' creamy yellow tassels drugged the air with the numbing scent of honey and the rhumba of bees." The linden trees are mentioned throughout the book as a bit of respite and a oasis of normality. Ackerman's telling of the atrocities that happened in the Warsaw ghetto is strong and powerful and numbing. She counters that with the crux of the book which is the story of the bravery and creativity and survival skills of Antonina, the zoo keeper's wife, and the underground activities of Jan, her husband. Their story is surrounded by the amazing stories of the people of Poland who risked everything to save those at risk. The bravery and ingenuity and humanity wouldn't be believed if this was a book of fiction. I feel enriched in having read this book and having my eyes opened to their story.